Here’s a moody floral wallpaper from Boho Luxe Home. We love seeing it paired with simple accents and dramatic, colorful art. The good news about this wallpaper is that its peel and stick. Perfect! That means, even a maximalist in a rental home can use it! We also love the more subdued vibe of the wallpaper, below. Of course we’d love to see this paired with even more fabrics and art – but even alone, it’s giving us the wow effect! We love the pop of a mix-matched pattern on the mid-century chair. This gorgeous damask-inspired Boho Luxe Home wallpaper has a similar color way. Quiet – but still maximalist, depending on how you use it. Imagine it mixed with black and white floors and a fringy, pillow-lined sofa…that would bump up the wow factor, and still be totally livable. Sometimes, it’s easier to live with loud wallpaper in a room you don’t spend lots of time in. A foyer, for instance, or a powder room. This tie-dye Boho Luxe peel and stick wallpaper is great for adding drama, as seen below. The shibori wallpaper below was used in style blogger Street Flea Style’s bohemian bathroom makeover, paired with Velvet Finishes’ Exotic paint color to liven up the vanity. See more photos from the big reveal, here – plus see many more peel and stick wallpaper options at Boho Luxe Home. Is pink your signature color? This one is kinda out there, and to be honest it’s not exactly our favorite shade, but in this space it is working overtime! Mixtures of neon yellow and green with this pink, plus this chandy, and the whole over the top commitment here just makes our hearts go pitter patter. And those glass doors – pssshhh – perfection! Don’t want to go that far? How about a “subtle” dash of color with graffiti! Any maximalist would agree…a mid-century sofa looks great with a bit of artful tagging! Here’s Boho Luxe Home co-founder Kellie Smith’s house, featuring lots of glitz and glam. Here’s another way to add some max. A patchwork of vintage flat-weave rugs, placed with their edges slightly overlapping, gives this library a worldly, bohemian-chic vibe. Layers upon layers – yes, so much yes! We love this bohemian maximalist interior. Tartan paired with chinoiserie? It’s a match made in pattern heaven. And that rug. That painting! Turquoise damask, pink patterns, and a multicolored rug – maximalist to the colorful core! Look at that wallpaper! Don’t want to go quite that far in your own house? Add layers with pillows and art, and keep your colors (just slightly) more subdued. Leopard print goes with everything, right? Ask any maximalist – the answer is YES! Leopard is a neutral! Check out how “calming” these leopard chairs are in this decadent green space! Or, just add a subtle touch of animal print with a stylized zebra print pillow. This one comes in velvet or a linen-texture. 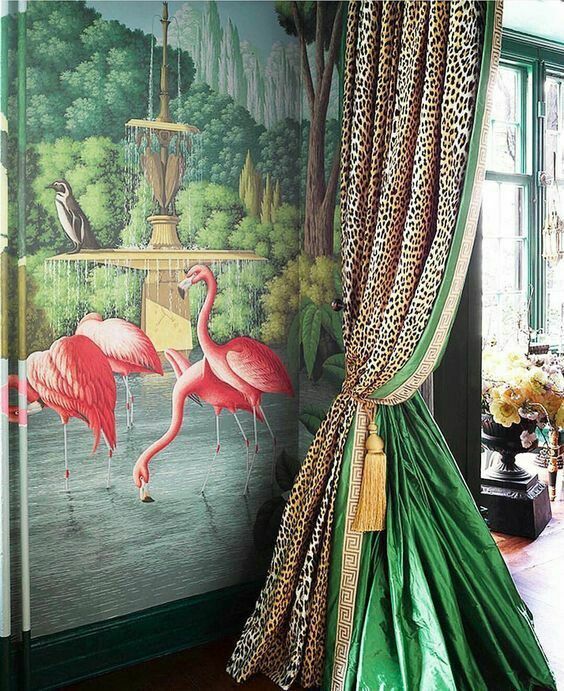 How about these tie-back leopard drapes paired with a flamingo mural. Wowza!! Or this BOLD zebra print made into drapes? Now that’s maximal! A riot of color, pattern, art, and textures – glammed up with a rock and roll 1970’s soundtrack. That’s exactly what a boho luxe interior is made of! Don’t hold back! Check out the zigzag carpet, the black Murano chandelier, the gilded hand chair. Yes, please. This eclectic mix in Boho Luxe Home co-founder Melanie Hönig’s house is definitely giving us the maximalist vibes, too. Classic blue and white ginger jars, a peach and grey marble antique console and a handmade Bedouin camel tassel – nothing matches – but it all goes! Love! And here’s a more casual take on boho luxe. From the mix of textures and patterns, to the natural elements – it’s stunning – and calming, too! Check out that luxurious velvet pillow sitting there looking all pretty, wearing an embellished tassel! Here’s what the luscious velvet pillow looks like, up close! This is a signature look from Boho Luxe Home and comes with a removable, shell and bead embellished tassel. What’s more maximal than that? Built-in shelving makes a maximalist lovers day! Seriously! Look at all of that space to display collections…what more could one desire? The color in this room is ah-mazing. A collection of art is proudly, casually and beautifully displayed in this maximalist bohemian bedroom. A gallery wall of art is a hallmark of maximalism. If you don’t have the space to go all out, just display your collections together in small vignettes on bookshelves or table tops. Place like with like – and sometimes through in something different. We like this display of organic shell bowls and a modern, acrylic take on butterfly collecting. A deep and rich wall color is a great place to start your maximalist interior. This mysterious living room is stirring up all our maximalism vibes. Black walls. Pops of color. A quirky and unique collection of objects and colors. Those lips. Those eyes. This room makes our jet black souls so happy! This room is so unbelievably amazing we don’t even have the words. Everything. About. It. And what about this dark, Venetian-inspired peel and stick wallpaper? Yes, please! And look at this space – the peeling wall, the lamps, the chandelier, the rug…divine and definitely maximalist approved! Here’s a paint-inspired removable wallpaper that’s a great way to add drama to your own space without making a commitment. Goes up easily — and when you want to remove it, it leaves no mess or residue. Be still my maximalist heart! Peel and Stick Wallpaper from Boho Luxe Home! 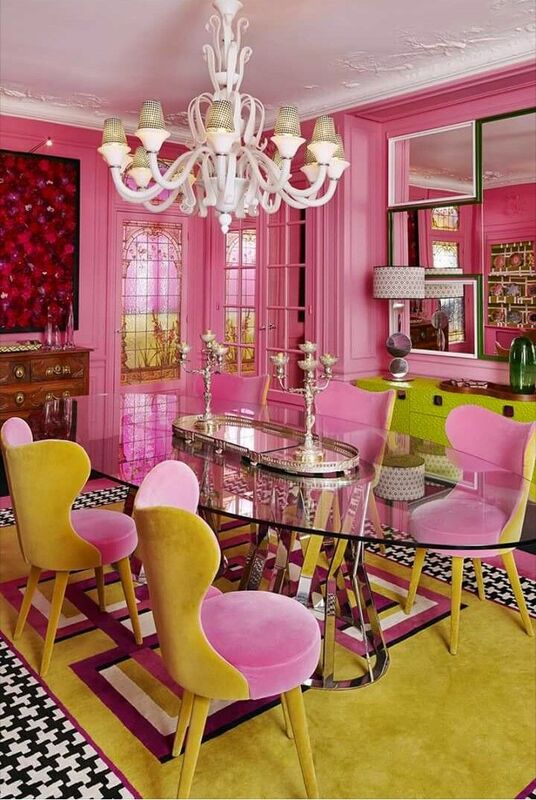 Colorful and eclectic, absolutely stunning and maximalist-ically (we made that up) magnificent! Art is your very best friend. If you can, support your local working artists. Or thrift some vintage pieces. Set against a whitewashed backdrop, this assortment of patterns is created by the room’s art, the zebra-print runner and the subtle herringbone flooring. Too many prints? We don’t think so. A splash, literally, of art against a black wall – we will take it all day long! Back to that mural idea. The one below is all sorts of gorgeous. It may be old, it may be new. It has a 3d effect. We love the imperfections, the cracks of color, the layers and the randomness. The hand-painted mural is beautiful. I mean seriously, it doesn’t get much better than this craftmanship and talent. Well, our maximalist craving is filled! At least for a moment. Which interior design idea was your favorite? We cannot choose! For more tips on how to incorporate a dash (or two, or forty-seven) of maximalism in your decor, stick around. We are going to keep showing you Boho Luxe Style! I love it all! Thank you so much! Oh, thank God! I thought I was all alone in my dislike of the current trend toward such austere minimalism. So glad I stumbled upon your wonderful blog. Thank you for the pictures; they help inspire my current remodeling project.